Go to your Contacts and select Lists tab from the top. Choose the list you’d like to import users to and click on Mass Import from the drop down option. A wizard popup will show where you can customize the import process and do your field mapping. The first step includes the list name, already pre-populated, as well as the option to specify if file headers exist on your Excel file (ex: Name, Email, Company, etc…). You can choose to update or skip contacts if they were already on that list. The file to upload must be a CSV or XLS are supported with a maximum size limit of 10 MB of data. Make sure the file is properly formatted and only includes the columns you want to import. Note: Random characters, badly formatted emails and missing required fields can break the upload process. After uploading the file, you can proceed to the next step where you map your Excel file columns (NAME ABOVE THE FIELD) to the fields you have created on your account under that list settings. 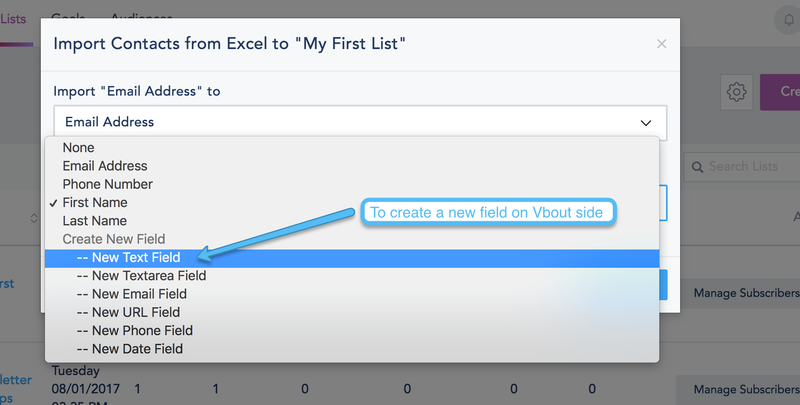 If you haven’t created the fields on your list to match your imported list columns, you can create them by choosing one field type under the Create New Field below. Once you are ready, you can click on Import and the process will start. An email summary of your import will be sent to the account admin email. NOTE: During the import process, the system scans every single record and matches it against existing fields, unsubscribe records, duplicates, bad formatting, required fields and more. This process can take a little bit of time. Make sure to check your file before uploading to make sure the data was properly formatted. If you are having an issue with the import, you can contact our support team and they will assist with the process.